Coffee belongs to the YesNoYesNoYesNo list of foodstuff that's constantly brewing both good and bad news. Of course, it's really caffeine that is the indulgence of concern. If you gorge on dishfuls of chocolate ice cream and bagful of chocolate bars, or quaff down liters of coke or pitchers of tea, there could be just as much caffeine to rev up your pulse rate, besides doing a number on sugar peaks. But it's the coffee that gets press on the good or the bad of caffeine. Well, for coffee drinkers, for now, the good news far outnumber the bad. Caffeine was first isolated from coffee in 1820 by German chemist Friedlieb Ferdinand Runge, called it "Kaffebase." In 1821,independently, it was isolated by French chemists Pierre Robiquet, Pierre Pelletier, and Joseph Caventou. However, myth, legend, and history are replete with stories dating coffee and caffeine use centuries earlier. Chinese legend narrates that around 3000 BCE Emperor Shennong was already tea-ing up on an accidental decoction of fallen leaves. The ninth century recorded the use of coffee beans in Ethiopia. Then there are the hyperactive and insomniac goats noted to graze on coffee shrubs. In the 17th century coffee houses started sprouting up in Britain and Western Europe. The West Africans started chewing on kola nuts, adding it to coffee berries and tea leaves as pick-me-uppers. And there's the cocoa bean, part of the caffeine landscape since antiquity, introduced to Europe by the Spaniards as xocolati, bringing the cacao tree to the West Indies and the Philippines. However, although caffeine comes from various sources, it is coffee that caffeinates most of us. Long, long before Starbucks, coffee houses in antiquity were popular gathering holes, providing, besides caffeinated highs, various other stimulants, music, entertainment, gambling, drugs, and opportunities for libidinous encounters. 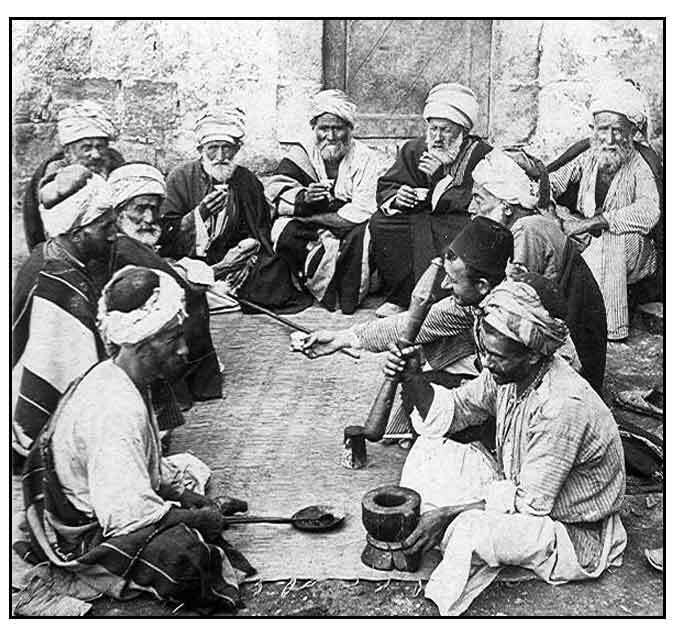 The photo above, a coffeehouse in Palestine, ca 1900. In the News: Can Coffee Intake Lower Mortality Risk? AS A POINT OF REFERENCE, AN AVERAGE CUP OF BREWED COFFEE CONTAINS 135 MG OF CAFFEINE; AN AVERAGE CUP OF TEA, 50 MG.
Natural Standard Safety Update: The U.S. Food and Drug Administration is investigating claims of deaths attributed to the the energy drink, Monster Energy®. The caffeine content of energy drinks are not always clearly included in the label. The American Academy of Pediatrics recommends that teenagers consume 100 mg or less of caffeine. A 24 oz can of Monster Energy contains about 240 mg of caffeine, about seven times the caffeine in a 12 ounce can of soda. For a comprehensive chart of caffeinated drinks on line, go to Energy Fiend. FDA limit for cola drinks is set at 0.02%, a max of 71 mg per 12-oz serving. At present, this limit does not apply to energy drinks. Two large studies confirm that higher coffee intake is linked to significantly lower risk for death. The EPIC (European Prospective Investigation into Cancer and Nutrition study results suggest higher levels of coffee drinking are associated with lower risk for death from various causes, specifically digestive and circulatory diseases. In a multivariable model, men who drank three or more cups of coffee a day had a 12% lower all-cause mortality than non-coffee drinkers. In the MEC (Multiethnic Cohort), a prospective population-based cohort study, higher consumption was associated with lower risk for death in African Americans, Japanese Americans, Latinos, and whites. The editorialists comment: While it would be premature to recommend coffee intake to decrease mortality and prevent chronic disease, it is increasingly evident that 3 to 5 cups of coffee per day (up to 400 mg/d) is not associated with adverse health effects. (Marcia Frellick / Medscape / July 10, 2017) Higher Coffee Intake Tied to Lower Mortality Risk - Medscape - Jul 10, 2017. An estimated 2.5 million persons (1.4% of the population in the U.S.) are MRSA (methicillin-resistant Staphylococcus Aureus) nasal carriers. Consumption of hot coffee or tea was found associated with a lower likelihood of MSRA nasal carriage and potential MESA infection. The odds of MRSA nasal carriage were lower for those drinking both beverages. The mechanisms await further studies and elucidation, for coffee it is attributed the potential antibacterial properties of trigonelline, glyoxal, methylglyoxal and diacetyl; and for tea, tannic acids and catechins. Additionally, both tend to decrease iron absorption, and iron is critical to Staph aureus growth. In addition, other studies have shown benefits with the use of green tea for debridement of MSRA-infected decubitus ulcers and nebulized green tea catechin extracts in decreasing MSRA in the sputum of elderly patients with cardiovascular disease. Coffee and Type 2 Diabetes - Drink Up? A Japanese study on 4,554 men, age range of 20-70, reports that drinking a cup of coffee or two a day lowers the risk of high blood pressure. Those who drank no coffee had a higher incidence of hypertension. The benefit was attributed to chlorogenic acid, a polyphenol found in coffee, considered to have an expanding effect on blood vessels. Another Japanese study reports a cup of coffee a day halves the risk of colon cancer among women. A study of long-term coffee drinking led by Esther Lopez-Garand at the Universidad Autonoma de Madrid in Spain followed 84,214 U.S. women from 1980 to 2004 and 41,736 U.S. men from 1986 to 2004. The result sent the coffee beans dancing: Regular coffee drinking – up to 6 cups daily – was no associated with increased deaths among the middle-aged participants. women drinking 2-3 cups of caffeinated coffee a day showed a 25% lower risk of death from heart disease. For men, the result was not statistically significant. There was also no association found with cancer. Studies on coffee drinking have been for the most part favorable — great source of antioxidants, lower risk of ovarian cancer, lowering of blood pressure. However, for pregnant women, a study showed twice the miscarriage risk on two or more cups of coffee a day. Decaf Coffee. . . Not! Wonder why you're still getting that caffeine buzz even after going decaf on doctor's advice? That familiar racing of the pulse? That tremulous charge? A study of 10 decaf samples from different coffee establishments showed levels of caffeine in the range of 0-13.9 mg/16 oz serving. Same outlet Starbucks decaf espresso and brewed coffee contained 2.0-16.8 mg/shot and 12.0-13.4 mg per 16 oz serving. respectively. 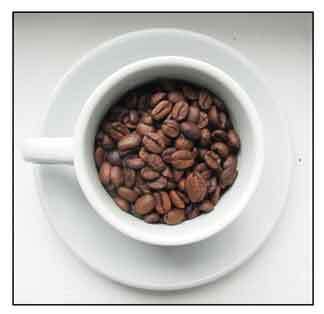 AS A POINT OF REFERENCE, AN AVERAGE CUP OF BREWED COFFEE CONTAINS 135 MG OF CAFFEINE; AN AVERAGE CUP OF TEA, 50 MGS. Although the math might suggest it will take 10 cups or more of faux-decaf to get the equivalent caffeine in a cup of regular brew, there are patients specially sensitive to the effects of caffeine who gets buzzed and charged at much lesser caffeine concentrations. Caffeine Content of Decaffeinated Coffee: Journal of Analytical Toxicology, ISSN 0146-4760, Vol 30, No 8, October 2006, pp 611-613.